Chocolate Orange cake, the scrumptious cake with the richness of chocolate and delicious orangey flavours, just got extra appealing with the nutty crumb. 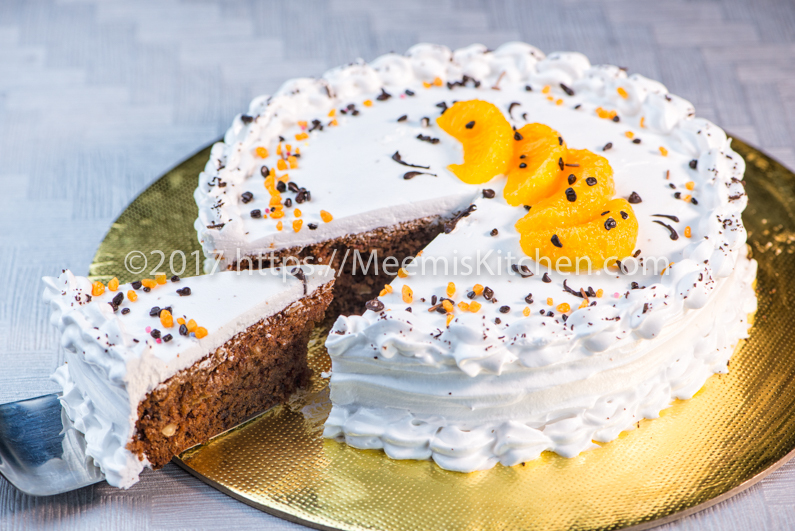 This spongy, moist, Chocolate Orange cake can be served plain as a rich tea cake or topped with whipping cream for special occasions. You will just love the perfect combination of chocolate, Orange and Cashew nuts. The citrus flavor compliments the richness of chocolate and makes this cake more alluring. The combination of chocolate and fruits are always wonderful; it is like double delight! If you are a chocolate lover, check out my Chocolate strawberry cake, Mocha Rum Cake, Black forest cake, Mahogany cake, Chocolate Brownies etc. Like all celebration cakes, this Chocolate Orange cake also takes a bit of time, but let me assure you, it is worth all the efforts and time. This recipe for Chocolate Orange cake is adapted from an old Chocolate sponge recipe and is moist and spongy at the same time. This Chocolate Orange cake has rich and deep flavours, and although little dense, it is fluffy with a nice crumb. I loved the light bitter bites of Orange rind in the cake, that adds punch and gives the perfect contrast to the rich chocolate and orangey flavours. You might also like my Orange cake, Carrot Apple Cake, Soft Cinnamon Rolls, or other tea cakes and fruit cakes like Traditional Christmas Fruit cake, Dates and Banana cake, Pineapple swiss roll or Dates Carrot cake. 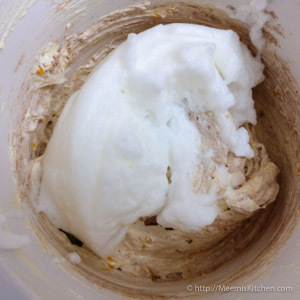 I used non-diary whipping cream for this recipe, as it is less messy than thick diary cream. Local oranges were used in this recipe, as it is in season and I wanted to add little rind to pronounce the orange notes. 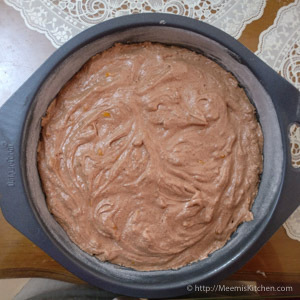 Hope you will try this wonderful Orange Chocolate Delight, to welcome the advent season. Enjoy!! Crush/ chop the cashews and keep aside. Peel one orange and take out the orange slices. Boil them in 1 cup water with 2 tbsp Sugar, for 10 minutes. Drain and allow to cool. Take little of the peel and clean the white part. 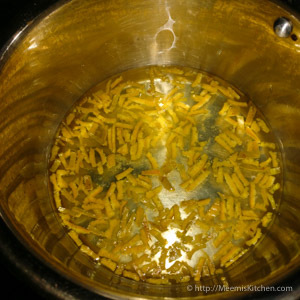 Cut into small tiny pieces and cook in the drained water for 5 minutes. Set aside. Take the cooked orange slices, peel the thin skin, deseed and take out the pulp. Squeeze one orange and extract half cup Orange juice. Keep aside. Grease a 10” tin and line it with butter paper. Then, grease and dust it with flour and keep ready. Cream the butter and sugar (175 gms) till they are well combined. Separate the egg whites and yolks (4 nos.). 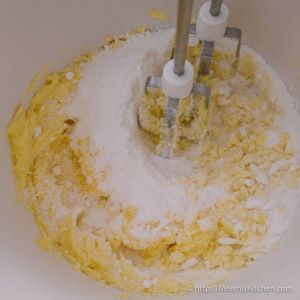 Add the yolk one by one to the butter mix and beat well. Now, combine the orange pulp to the butter mix. Also, add quarter cup of orange juice and a few drops of Orange Essence. Sieve together Maida (100 gms), Cocoa Powder (25 gms), Baking Powder, Baking Soda and Cinnamon powder, three times. 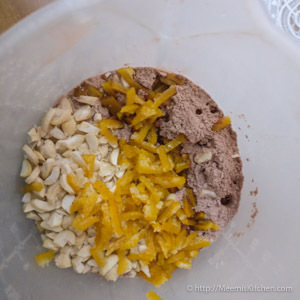 Mix the chopped Cashew nuts and two tsp of cooked Orange rind/ Peel with the flour. Beat the egg whites till stiff. Preheat the oven to 200o C. Gently fold in the flour and egg white alternately to the butter mix and combine well. Pour to the greased tin and then bake in the preheated oven for 30 – 35 minutes, till the inserted toothpick comes out clean. Let it cool completely. 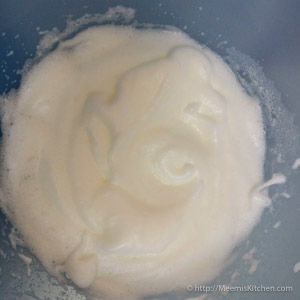 For preparing whipping cream, transfer to a bowl placed in a larger bowl of iced water and beat well till soft peaks are formed. Sprinkle 2 tbsp Icing sugar and continue beating till you get stiff whipping cream. Boil ¼ cup of water and dissolve 2 tbsp Sugar in it. Add quarter cup of Orange juice and let it simmer for few minutes. Take it off the flame. Run a knife round the side of the cake to loosen it. Invert the cake to a wire rack or Parchment paper. Peel off the lining paper. Pour the orange syrup over the cake to make it moist and soft. Spread the whipping cream smoothly with a palette knife. Cover the sides with cream and smooth it. Put the remaining cream in a piping bag with decorating nozzle. Pipe on the sides and decorate with cooked orange slices and sprinkles/ chocolate shavings etc. Enjoy! Always make sure you have the correct measurements. (It is better to have weighing scales. or cake measuring cups, to get exact measures). 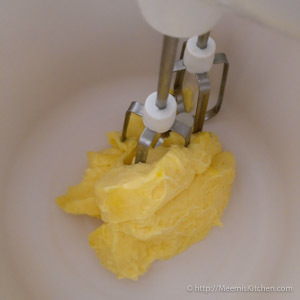 Use good quality Butter, Baking Powder, Baking soda and fresh eggs. 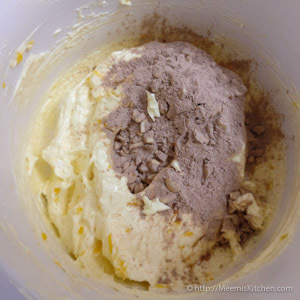 Flour, baking powder/ Soda and Cocoa Powder should be mixed well. Sieve 3 -4 times to release air bubbles. I have used Orange essence (only few drops) for this recipe. If you don’t have Orange essence, add vanilla instead. Orange rind/ Peel balances the richness of chocolate and orange. Carefully scrape the white pat of the peel and cut into very fine pieces and cook in sugar syrup. If you don’t like the bitter bites, add less Orange rind or omit it. Always fold in the flour gently to ensure that the cake is soft and airy. Over mixing of the flour makes the cake hard. This cake should be baked at the correct temperature mentioned. I have used non-diary whipping cream as it gives a good texture and taste. It is non – greasy and has more stability than diary cream. To smoothen the cream. 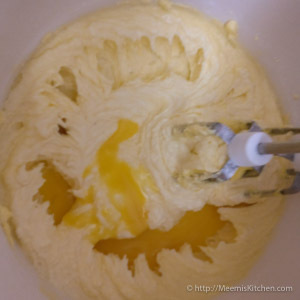 Keep the palette knife gently on top of the cream and turn the cake to get an even spread. Do not worry if it is not perfect the first time. Practice makes it perfect over time. Warm Orange syrup is poured over the cake to make it super moist and soft. 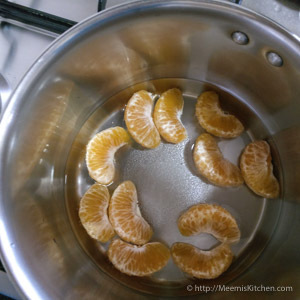 Although the process seems a bit long, you can do most work like chopping the nuts, cooking the oranges, peel and prepare the juice in advance. The rest is cake walk! Hope you liked this Chocolate Orange Cake recipe. 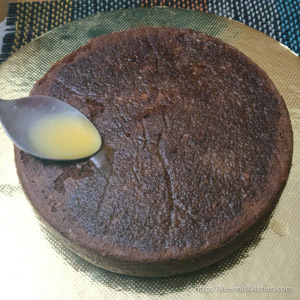 Enjoy with family and friends on special occasions or have it as a rich tea cake. Please continue to support and encourage me by commenting below or by sharing to your friends using the links on the side. God Bless! !